ACOUSTIC MANGO - their name pretty much sums it up ... that is if you know what it stands for. While they discussed it over time, locals Brad Fry and Gary Annett decided to bite the bullet (or in this case the mango) and form a duo - as a branch of their existing band, Just Quietly. And the reason behind the bizarre group name - both play acoustic and MANGO inevitably stands for, 'me an' Gaz only' - as Brad says. Brad says they entertained the thought of a duo for some time as trying to get gigs for their four-piece band Just Quietly was sometimes tricky. "Some places, the moment they find out you have drums, they say no, which you can understand," he said. "So we thought we'd branch out and do this." And so far, the duo has started producing fruit. Acoustic MANGO is set to perform in Rockhampton at the Glenmore Tavern on Friday January 31 and Dicey's Bar and Grill on Saturday February 1. While Brad finds time to write his own songs, the duo tends to focus on cover songs, keeping the crowds happy at gigs around town. 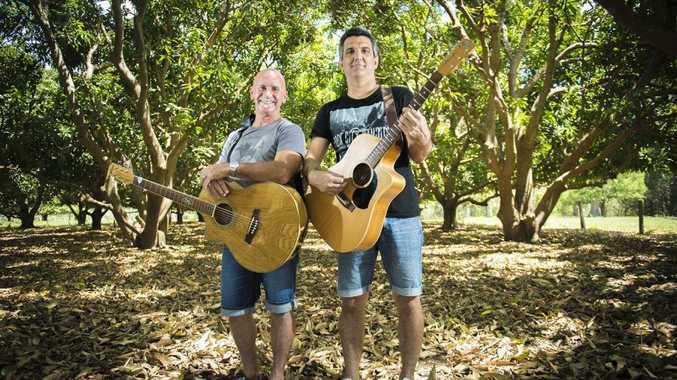 Acoustic MANGO set to take on local live music scene: While they discussed it over time, locals Brad Fry and Gary Annett have decided to bite the bullet (or in this case the mango) and form a duo called Acoustic MANGO – as a branch off their existing band, Just Quietly. In this video the pair perform an abridged cover of Van Morrison's popular hit 'Brown Eyed Girl'. From the '60s up - the duo tries to mix it up on the stage. "I started playing (guitar) in the early '80s. But I was a left-hander trying to play a right-handed guitar - it just wasn't working," Gary said. Ten years later in Kalgoorlie, "A bloke said to me, just buy a left-handed one (guitar) and have another go. And I did and it felt a lot easier". Gary has been playing since about 1996 and Brad has been playing for 11 years. "It's a labour of love," he said. Dicey's Bar and Grill - Saturday, February 1, 8-midnight.